The standards for Hannibal were set by some of the best in the biz. The titular character, serial killer Dr. Hannibal Lecter, had been portrayed onscreen by Brian Cox and Anthony Hopkins, the latter of whom won an Academy Award in his first of three outings as Lecter. Previous adaptations of Thomas Harris’ Lecter novels had been helmed by such towering cinematic names as Jonathan Demme, Michael Mann, and Ridley Scott. (And, sure, Brett Ratner, too—but those first three remain impressive even in his presence.) Even the instrumental scores of the films in which Hopkins played the brilliant psychiatrist-turned-cannibalistic psychopath came from top-flight talent: Howard Shore, Danny Elfman, and Hans Zimmer, successively. Before Hannibal premièred, these major-league pedigrees made Bryan Fuller’s retrofitting of Red Dragon feel every bit the second-string effort its midseason starting date suggested. Standing in the shadows of giants, telling a story that had been told and retold, how could NBC’s Hannibal even hope to bring something new to a character who, in the span of 30-plus years, has became something of a Grand Guignol Sherlock Holmes (minus the moral center)? In short, by getting smaller and weirder. 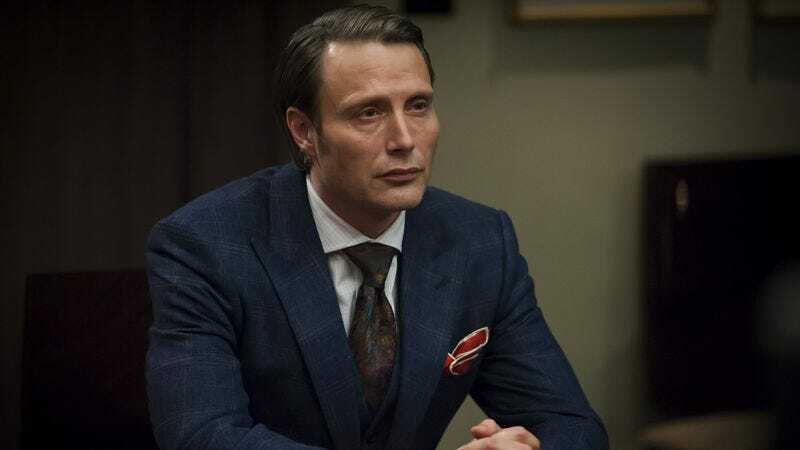 The last thing the viewing public needed in the spring of 2013 was another iteration of Hannibal The Cannibal, but Fuller and his team culled a new vitality from within the source material. While maintaining the crime-thriller aspects that engrossed readers and moviegoers alike, Hannibal took the utterly nightmarish qualities of Harris’ world and made them feel like an honest-to-goodness nightmare. All of Hannibal’s first 13 episodes play out in a dreamlike haze, their abrupt turns to gore and unsettling hallucinations granted the cruel lack of logic of authentic nocturnal terrors. This extends to the response to Shore, Elfman, and Zimmer from drummer, composer, and music supervisor Brian Reitzell as well. Gauzy cinematography and hyper-stylized art direction set the scene for Hannibal’s waking nightmares, but it’s Reitzell’s atmospheric scores that keep the show straddling the line between the real and the unreal—making Music Composition For A Series (Original Dramatic Score) one of the many technical categories in which Hannibal deserves an Emmy nod. Having made his earliest screen contributions as the music supervisor for Sofia Coppola’s full-length directorial debut, The Virgin Suicides, Reitzell comes from a background of unobtrusive soundtracking. (Think of The Virgin Suicides and its main theme by Air, whose LP 10 000 Hz Legend LP features drumming by Reitzell.) With Hannibal, the specifics of any given episode are already so horrifying and outside of the norm that they don’t require the jumpy stings of a standard horror score. For the most part, Reitzell’s work unmoors the viewer subliminally, forgoing the classical bombast of Shore or Zimmer’s Lecter scores for ambient clashes of sustained tones. If nightmares had a soundtrack, it’d sound something like the intractable fluttering that matches Will Graham’s sweaty stupor at the top of “Savoureux.” Hannibal’s first season is a succession of safety nets pulled out from under its protagonist, and the reactive, improvisational nature of Reitzell’s score pulls the same trick for the viewer. Not that the show is without its moments of sound and fury: One of Dr. Lecter’s most heinous crimes, a death by immolation in “Relevés,” is accompanied by a pulse-quickening clatter that combines Reitzell’s percussive acumen with the string-section scrapings that haunt the corners of every Hannibal installment. In many ways, the sounds of the sequence echo the show’s theme song, TV’s most atonal sonic stamp this side of Homeland. While the mournful avant-jazz of that series’ main title sounded strangely deflating as Claire Danes and company swept up at the 2012 Emmys, a ceremony dominated by Hannibal would sound even stranger. The only things that could push an award show to greater heights of surreality are occasional bumps of Reitzell’s moody drones. Perhaps the spookiest aspect of Hannibal’s original score is that it’s always present, even when it’s imperceptible. In an interview with Film Music Magazine, Reitzell notes that some layers of his score for the show fly below the frequency range for standard TV speakers. So even when the viewer is paying the closest attention possible to an episode, there are lower-than-low beds of analog synthesizer lurking in the shadows. That’s perfect for a show like Hannibal, where the creative team could’ve grafted an established property on to the Criminal Minds model—but instead opted to dig deeper, to go below the surface, and suss out the primal, unspoken qualities that make Thomas Harris’ most famous creation alternately fascinating and frightening. It’s there in the ultimately unpredictable nature of a monster whose crimes are otherwise dictated by routine and discipline—characteristics made audible by Reitzell’s impulsive scoring. Just like Dr. Lecter, he’s developed a process that gets to the tastiest bits of his quarry.